We recently went for the most amazing lunch at a new restaurant called Portland. Not your everyday lunch spot, but we were treating ourselves and it felt incredibly spoiling. The plates were small, light, beautiful and incredibly tasty. We started with the white truffle and gruyere macaroon with a delicious glass of very cold white wine, and it just got better and better… The dishes were exquisite, and very inspiring. Half of what you eat is about the taste, but the other half is how you make something look, how wonderful to be given something so aesthetically pleasing. This is something that we always keep in mind when creating the menu, and plating up on shoots – to think about the colour, the texture and how to make something look beautiful. At Tart we are mostly putting together sharing platters, but there is something very special about plating up individual plates, making your own little masterpiece. This is not something that we are going to do every night of the week, but if you are planning a special dinner party then take the time with a little love and care to create a dish that you are proud of. This recipe was motivated from a dish that we created for a Mulberry lunch last year, the lunch was for inspiring and talented women so the pressure was on! With it being a hot May day we wanted to serve something chilled, light and beautiful. There is nothing more decadent than crab, and it has just come into season so thought that would be ideal. You don’t want to overcomplicate crab as it is so subtle and wonderful in its natural form. 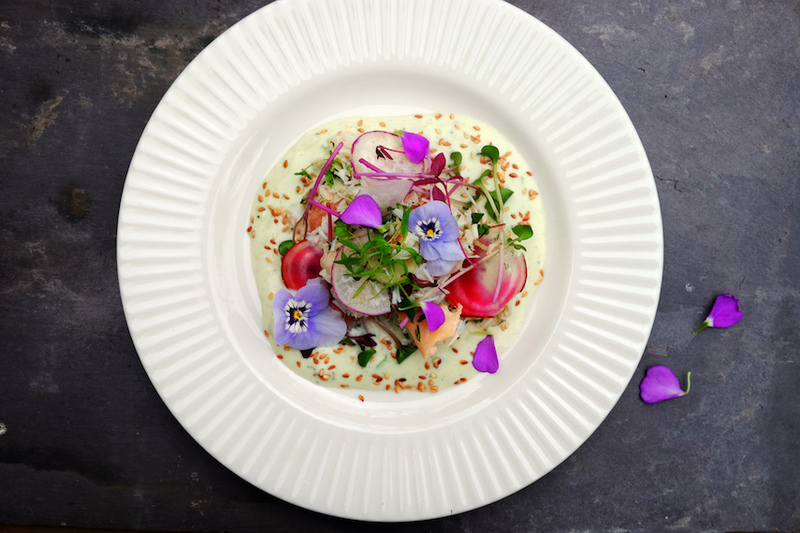 This dish is surprisingly simple – its all in the decoration, you want to keep it delicate and feminine, try and pick up some edible flowers. The best results come from boiling your own crab, but if you don’t have the confidence then its easy enough to pick up good quality, hand picked British crab, even if you don’t live by the coast. Your local fishmonger should be able to provide fresh crab meat (you might have to order in advance), and do pick though it though to make sure there is no shell, Ocado also deliver a very good hand picked Dorset crab. 1. First make the cream. Mix together the crème fraiche, wasbi, lime zest and juice and leave to the side. 2. Toast sesame seeds in a small pan over a medium heat, leave to the side. 3. Carefully mix the crab, lemon juice, lemon zest, mint and dill with a good pinch of salt and freshly ground black pepper. Taste and add more seasoning if needed. 4. To serve put a dollop of the cream mixture on a plate and spread evenly to cover the most of the bottom of the plate, then sprinkle the toasted sesame seeds over. Place a few leaves in the middle, radish slices and beetroot if using, then a spoonful of the crab mixture. Carefully layer up with a few more leaves, crab and decoration. Finish with a carful drizzle of olive oil.